Garver provided services to replace the eastbound State Highway 51 truss bridge over the Verdigris River near Wagoner, Oklahoma. The new girder bridge is an 805-foot, two-lane structure. The project involved improving roadway approaches, raising the bridge's profile grade, establishing standard paved shoulders, and providing proper clear zones for 2.6 miles. This portion of the Verdigris River is along the McClellan-Kerr Arkansas River Navigation System, and it connects the Tulsa Port of Catoosa to the Mississippi River. Garver's bridge design involved providing barge traffic with lateral and vertical clearance to safely travel under the new structure. One of the unique project aspects involved demolishing the existing bridge by a series of synchronized explosions. Multiple truss spans were removed to make room for plate girder main spans. The Oklahoma Department of Transportation provided Garver with a video showing the explosions and bridge demolition. 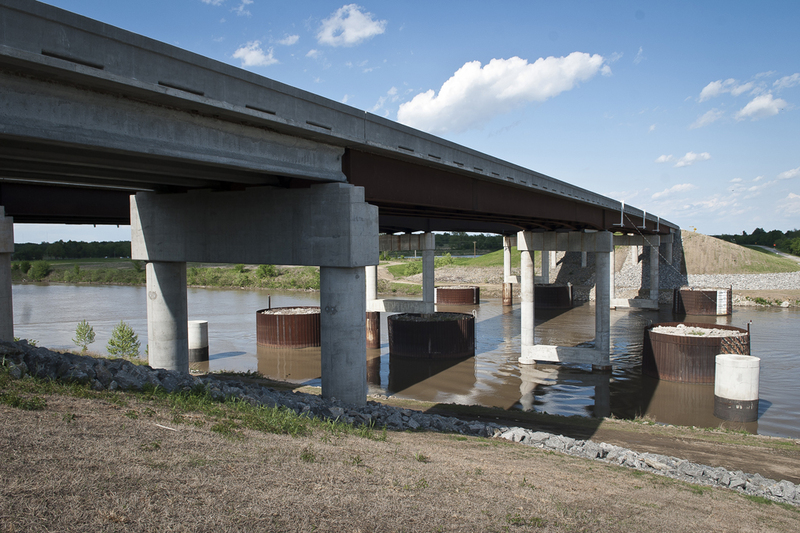 Garver's services included preparing detailed roadway, right-of-way, and bridge plans, a hydrology and hydraulics study, traffic engineering and construction control, and surveys.